Please support our site's generous sponsors. Millions of people worldwide who enjoy the benefits provided by cars and trucks also suffer the miseries of traffic pollution. But advances in automotive technology are helping to stem the tide of pollution and recent U.S. research into the effectiveness of one particular anti-pollution automotive component has uncovered one of the planet’s greatest environmental success stories which may have far-reaching global implications for as markets for new cars expand. The device in question is the catalytic converter, which cleans gases passing through vehicles’ exhaust systems. Engineers estimate that during the last 11 years 130 million catalytic converters used in the U.S. have eliminated automotive pollutants that-if unchecked and unabated-could have covered the country with a toxic blanket of carbon monoxide more than 500 feet deep. The carbon monoxide was captured from exhaust streams by catalytic converters and converted into harmless carbon dioxide. Engineers say that between 1975 and 1996, emissions control technology cleaned automotive exhaust streams in the U.S. of about 195 million tons of carbon monoxide; nearly 42 million tons of hydrocarbons; and at least 37 million tons of oxides of nitrogen. The carbon monoxide, at standard pressure and temperature (one atmosphere at 32 degrees Fahrenheit) and 100 parts per million concentration (the toxic level) would pile 512 feet high over the 50 states. The U.S. Environmental Protection Agency (EPA) data shows that due to emission controls, vehicles now sold in the U.S. emit 96 per cent less carbon monoxide, 98 per cent less hydrocarbons, and 90 per cent less oxides of nitrogen than vehicles sold in the early 1970s. The improvement in air quality is continuing, as new vehicles are equipped with the latest emission control technology and older cars are scrapped. Currently, 85 per cent of automotive air pollution in the U.S. comes from the oldest 50 per cent of vehicles on the road. Catalytic converters typically consist of a ceramic or metal honeycombed monolith substrate that carries precious metal catalysts. The coated substrate is wrapped in an intumescent mat that expands when heated, securing and insulating the substrate which is packaged in a stainless steel shell and fitted into the engine exhaust system. As exhaust gases pass over the catalysts, they promote chemical reactions that convert pollutants into harmless gases and water. Hydrocarbons combine with oxygen to become carbon dioxide; oxides of nitrogen react with carbon monoxide to produce nitrogen and carbon dioxide; and with hydrogen to produce nitrogen and water vapour. The catalyst formulation, which promotes a faster chemical reaction at a lower temperature, is usually a mixture of the noble metals platinum, palladium and rhodium, and sometimes other catalysts such as the rare earth ceria. A catalytic converter is not a stand-alone cure-all for emissions control. Unleaded fuel is required. And to operate properly, a converter is fitted as part of an engine management subsystem - an integrated set of specific-purpose emission control components. 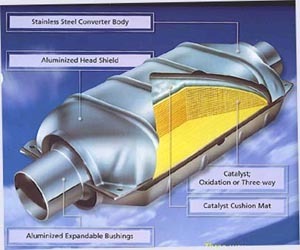 Catalytic converters typically consist of a ceramic or metal honeycombed monolith substrate that carries precious metal catalysts.